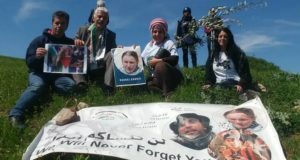 Villagers in Burin are attempting to open a new road, in order to connect the village with the main road heading towards the city of Nablus. This project has been met with much violence and protest from the nearby illegal settlements. 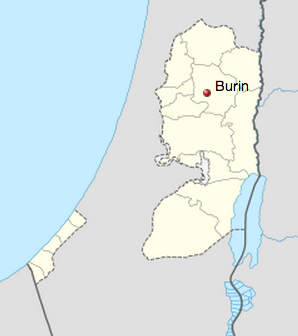 The village of Burin has a long history of violence from the surrounding illegal settlements of Givat Roven (to the East), Bracha (to the North) and Yitzar (to the South). Additionally, to the West of Burin is a military training camp for Israeli forces. Due to their illegal neighbours, Burin has had to face attacks against the village mosque, theft of animals from local farmers, and settlers throwing stones at villagers. The building of the illegal settlements surrounding the village has stolen over 14000 dunams of Burin’s land. ISM activists met with Bilal, a Palestinian working on the new road. 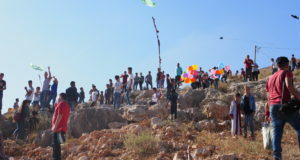 He described how on the 8th April, settlers from the illegal settlements of Givat Roven and Yitzar arranged a demonstration against the attempted new road, which runs from Burin village, over a large hill, connecting with the road to Nablus. The settlers were marching alongside of the hill and shooting live ammunition up into the air. Bilal described how settlers and Israeli soldiers regularly attempt to prevent the building work and harass those working on the road. Bilal also explained that last year, settlers from the illegal settlements of Yitzar and Givat Roven burnt nine cars belonging to villagers in Burin. The area where the intended road will be built is in Area B [Palestinian civil control, joint Israeli and Palestinian security control]. When the road is finished, it will pass only 15 meters from the illegal settlement of Givat Roven. Some of parts of this illegal settlement, which lies within Area B, were recently declared illegal by the Israeli High Court and were evicted by Israeli forces two days ago. 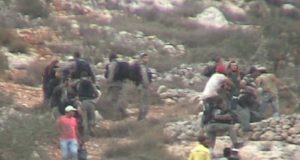 This led to a clash between settlers and the Israeli military, with some settlers injuring soldiers, leading to their arrest.